Jackson's lawyer said he would release a formal statement Friday morning about his discussions with Katherine Jackson. He has previously said he will move to re-instate her as guardian over Jackson's children, Prince, Paris, and Blanket. A judge on granted Tito Jackson's son TJ temporary guardianship over the children, citing concerns that Katherine Jackson was being prevented from fulfilling her role as guardian. 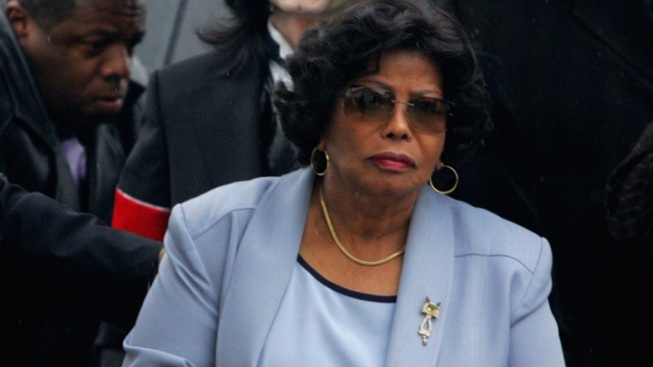 Katherine Jackson's attorney said late Thursday that he had met with his client face-to-face for the first time in several days and that she was doing fine despite familial squabbling that forced a judge to temporarily suspend her as guardian of her son Michael's three children. "I had a long and productive meeting today with Mrs. Jackson," Perry Sanders Jr. wrote in a statement. "I am pleased to report that she is fine and she laughed at the widely publicized report that she had suffered a stroke." The description of Jackson suffering a stroke was included in a letter signed by five of her children calling on executors of Michael Jackson's estate to step down. The letter was leaked last week and was an early sign of turmoil that was to come for the Jackson clan. Since late Saturday when a relative reported Katherine Jackson missing, speculation has swirled about her whereabouts, her health and why she hadn't called her grandchildren for nearly 10 days. Rival factions in the family released dueling statements on Twitter and family members tussled in the driveway of her home in an incident that remains under investigation. Sanders said he would be releasing a formal statement Friday morning about his discussions with Katherine Jackson. He has previously said he will move to re-instate her as guardian over Jackson's children, Prince, Paris, and Blanket. Although Thursday was a mostly quiet day in the ongoing Jackson family turmoil, it was not without drama. "Although I am happy my grandma was returned, after speaking with her I realized how misguided and how badly she was lied to," Prince Jackson wrote in a posting on his Twitter account. "I'm really angry and hurt." Hours later the post was deleted, but re-emerged by late afternoon, with the eldest son of Michael Jackson wondering if his account had been hacked. The post was the first time Prince Jackson, 15, had publicly commented on his grandmother's absence. A judge on Wednesday granted Tito Jackson's son TJ temporary guardianship over the children, citing concerns that Katherine Jackson was being prevented from fulfilling her role as guardian. Superior Court Judge Mitchell Beckloff said there were no indications the 82-year-old had done anything wrong, and he would likely re-instate her upon her return. Katherine Jackson had been at a Tucson, Ariz. spa since July 15 with her daughter Rebbie and other relatives and had not spoken to her grandchildren during that time. TJ Jackson and numerous others said that was unusual and when she did call, he said she sounded "strange." "I've never heard my grandmother talk like that," he said reluctantly. "In every way. The sound in her voice. The pauses." Sanders, who had flown to Arizona to try to meet with his client on Tuesday, was not allowed to see her at the resort. He said some of her speech sounded slurred and she used words that made him wonder if she was speaking in code. Before leaving Arizona to return to her hilltop home in suburban Calabasas, Katherine Jackson told ABC News that the court ruling was "based on a bunch of lies." If Katherine Jackson does not move for an emergency hearing to reinstate her guardianship position, another hearing in the case will be convened Aug. 22.